We did this a couple of weeks into the season, and hope to have more meaningful data to share when looking at pitchers from the entire first half of the 2011 season. We're looking at pitchers with a minimum of 50 innings pitched this season. We have no dillusions of this being groundbreaking or difficult, it's just something we don't hear or read about much. Please feel to add to the conversation in our usual channels. Normal disclaimer: As we've discussed in the past, in an ideal world, it's best to get pitchers who strike out a lot of batters and walk very few. In addition, pitchers who induce ground balls and popups are preferred to fly ball pitchers. 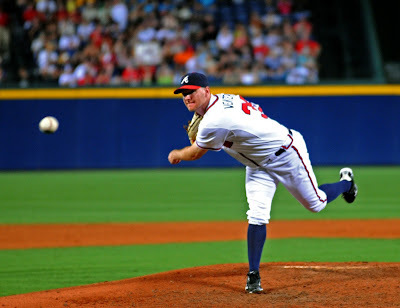 DANGER: Venters has already thrown 55 innings this year. I am surprised by the Fausto Carmona sighting, but this is a very focused search. The problems pitchers may have with walks, lack of strikeouts, or poor defense could make for subpar results even with these two strong peripherals. What are some of the better ways to consider and evaluate batted ball data for pitchers? After all, this space is for you, and like any good host, we will gladly take requests.